Card # 595 joins the Hoard. 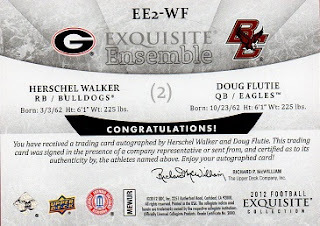 This is a dual autographed card of two Heisman trophy winners. Herschel, of course, and Boston College legend, Doug Flutie. It's from the Exquiste Ensemble set from Upper Deck. It is serially numbered to 30, with this being the 20th in the series.